What are vaccinations and why are they given? Babies and young children are especially vulnerable to infectious disease because their bodies have not yet built up a resistance. A vaccination helps the body to develop its own immune response that helps defend and protect it against that particular disease. 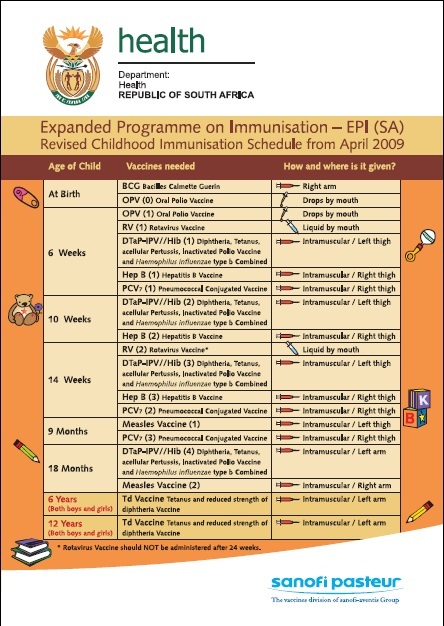 The World Health Organisation has an Expanded Program on Immunisation (EPI), which has been adopted by the South African Department of Health. 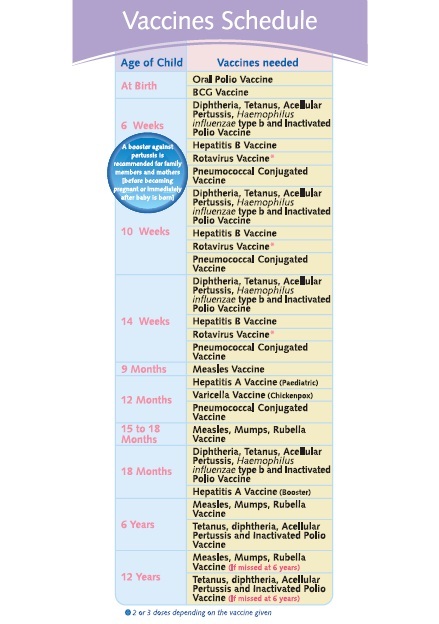 These are in the normal schedule of vaccines that are available free of charge. In addition to EPI vaccines, there are other vaccines that are available in the private sector. Below are detailed charts of the EPI and private vaccination schedules. What are the possible side-effects of vaccinations? What do the different vaccines protect you against? PCV (Prevenar) Pneumococcal Vaccine: Prevention against Pneumococcal bacteria which can cause pneumonia, septesimia, otitis media and meningitis which could be fatal in children. Synflorix Pneumococcal Vaccine: Prevention against Pneumococcal bacteria which can cause pneumonia, septesimia, otitis media and meningitis which could be fatal in children. Varilrix: Chickenpox. It is recommended that this is given with the Measles vaccine. Because they are both live vaccines they have to be given together. If they are given separately, they have to be given a minimum of 4 weeks apart. Gardasil: The only Quadrivalent HPV vaccine (HPV= Human Papillomavirus). It protects against HPV 6, 11, 16 + 18 (Cervical, Vulvar and Vaginal Cancers and Genital warts). Cervarix: An HPV (Human Papillomavirus) vaccine for protection against HPV 16 + 18 (Cervical, Vulvar and Vaginal Cancers and Genital warts). What vaccines are provided at Baby Guardian Vaccination Clinic? Baby Guardian has both the state supplied vaccines and also the alternative private ones that are completely optional. We also supply flu vaccines that help protect your body against the most current strain of flu (these are not advised for babies less than 6 months). With every baby wellness visit, the consultation takes about 30 minutes. During this time your baby will be weighed, measured and checked according to developmental milestones. Any questions or concerns you may have will also be discussed. Will my medical aid cover the cost of vaccinations?